Mojo Compression Arm Sleeves are perfect for golf, basketball, baseball, running & outdoor activities. Sized for both Men & Women, sleeves create a simple way to quickly adapt to changing conditions. The advanced material provides improved warmth while wicking moisture away and they offer 99% UV Protection and help protect arms from abrasions blisters. SUPPORTS THE ARM MUSCLES: The Mojo Compression Arm Sleeves supports the arm muscles with a comfortable gradient compression. The compression effect decreases from wrist to upper arm, promoting circulation. The muscles receive a better supply of oxygen, for optimal performance. STIMULATES CIRCULATION: The sleeves stimulate blood circulation causing the arm muscles to quickly heat up, which helps protect against injury and supports faster recovery times. KEEPS YOU DRY: By wicking sweat away, your skin remains cool and comfortable . COMFORT AND EASY CARE: The sleeves, which come in a sporty design, are sold as a pair and are durable, breathable and extra-soft in the elbow area for increased wearing comfort. Machine washable (see product packaging for details). FIT AND SIZING: Measure the circumference of the wrist and also the upper arm two fingers below the armpit. Length is determined from the distance from the wrist to two fingers below the armpit. 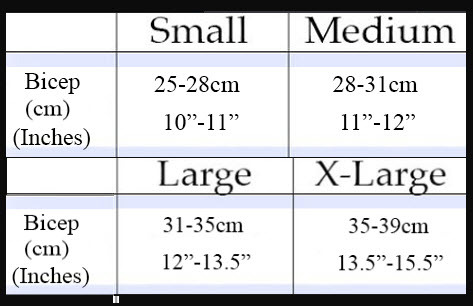 Refer to the sizing chart in the product images for a size to associate with this measurement. 100% SATISFACTION GUARANTEED: With proper use and care, our products are designed to last. We stand behind everything we sell. We stand behind everything we sell. If you are not satisfied with your purchase, you can return it for a replacement or refund within 30 days of purchase. MADE IN Taiwan with the highest quality standards and materials. The compression is toooooo low. I do not know the purpose of this sleeve, but excluding being a sun screen, it does not do much. It is similar to a very thin socks. I have Mojo's socks and they have much more compression. Disappointed in the product.